The sound of small footsteps intrudes into my consciousness. I dose her up and tuck her into my bed next to me where she wriggles and squirms for the next two hours, finally becoming still just before her little brother comes in for his dawn cuddle. It’s Show Day. Where “Country comes to Town” for the Canterbury A&P (Agricultural and Provincial) Show (www.theshow.co.nz), the climax of the biggest week of the year in the Christchurch Calendar “Cup and Show Week” (www.nzcupandshow.co.nz). It’s a provincial public holiday today, and we had been planning to go and see “the Show.” It’s a “Royal Show” this year thanks to a planned visit by the Prince of Wales and Duchess of Cornwall. Oh well, Daddy gets to take the other children and I get to stay home and be Mum. 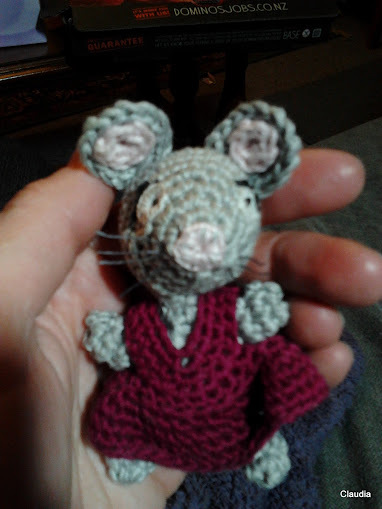 In other news, my sister introduced me to www.ravelry.com. I think she’s glad to have another crafter in the family finally. I’ve found this pattern, and made a prototype for some Christmas Hamper and Stocking Fillers. A quiet day at home will be a good chance to make her Friends and Relations. I think I’ll keep Millie for myself though. Even the least observant among you will have noticed I’ve been a bit off-line this winter. It turned into an unplanned sabbatical. There’s a primitive part of me that seems designed to hibernate in the winter. All I want to do is retreat to the warmest part of the cave, in front of the fire, with a cave-cat on my lap and knitting or similar in my hand. I can knit peggy squares. 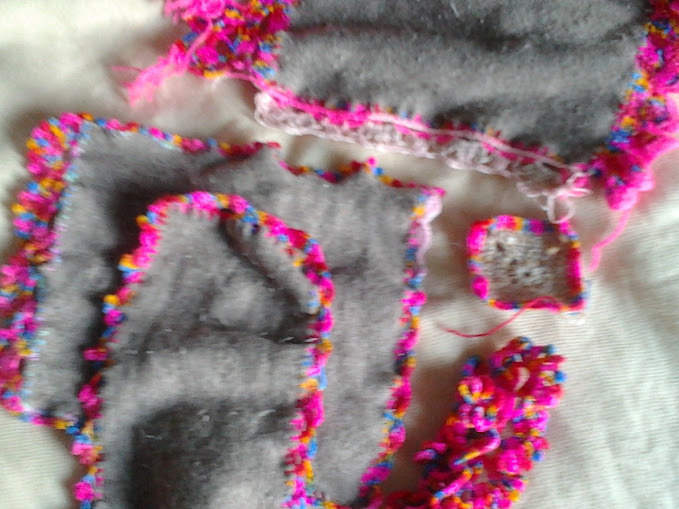 I sort of had in mind a blanket or three (If I do one for one child the others will want one too. 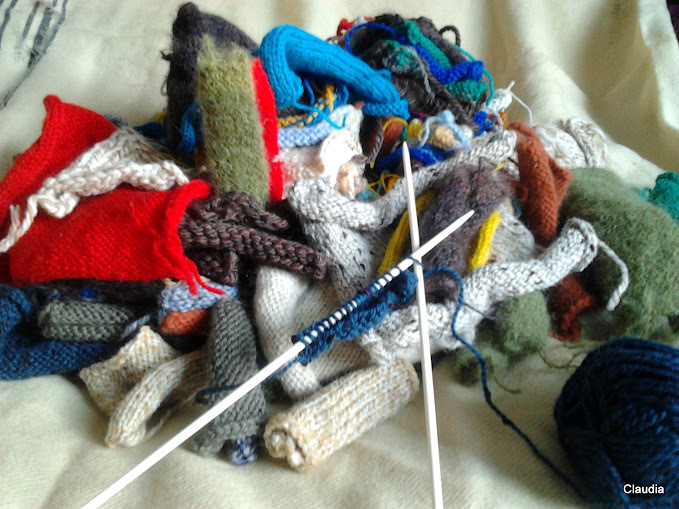 When I was still only a fraction of the way through how many I’d need for the three blankets I got bored with knitting squares. I decided to learn to crochet and found a book a the library. 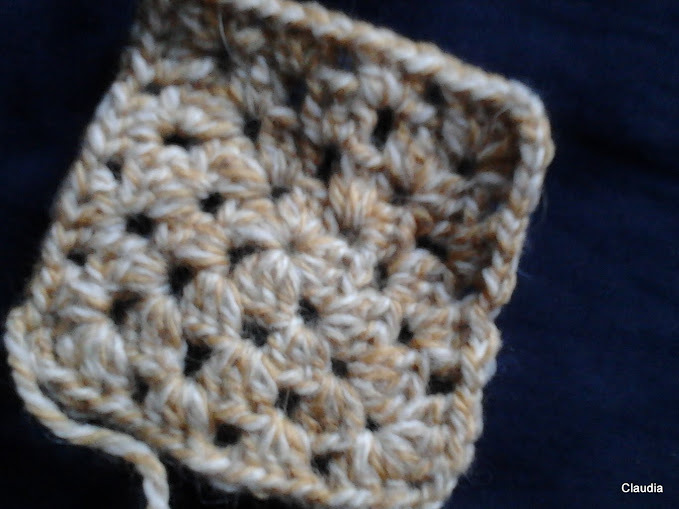 I started with a granny square. 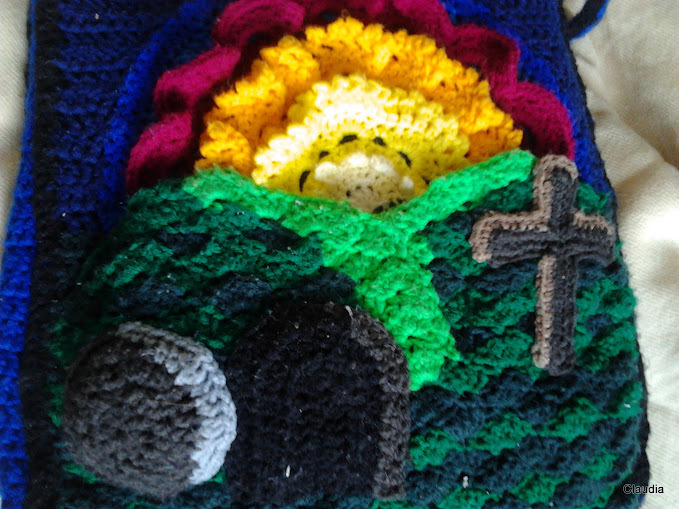 Then I tried some edging – I practiced with some doll’s blankets. Then I spotted some colourful acrylic yarn at the local wool shop, and thought that with the textures and shapes from the crochet I could make a picture. I merged ideas from about three different library books, and did lots of unravelling and trying again when I wasn’t happy with how it was working out. Then I thought I could expand on the “sun”, join the two together and make myself a tote-bag. 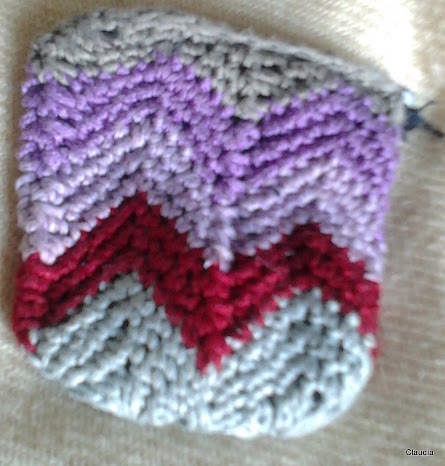 I spotted a crocheted coin purse in a shop, and thought “I could make that” so I gave it a go – with much unravelling and re-working. 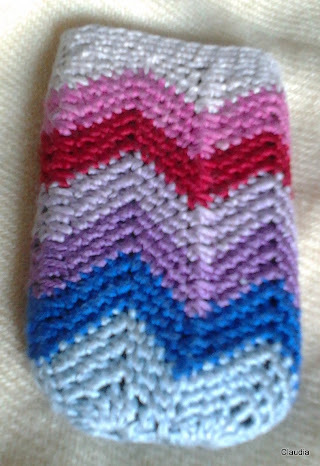 Then I made a cell-phone cover. And then I got onto a bit of a roll and made a pencil case and notebook cover. 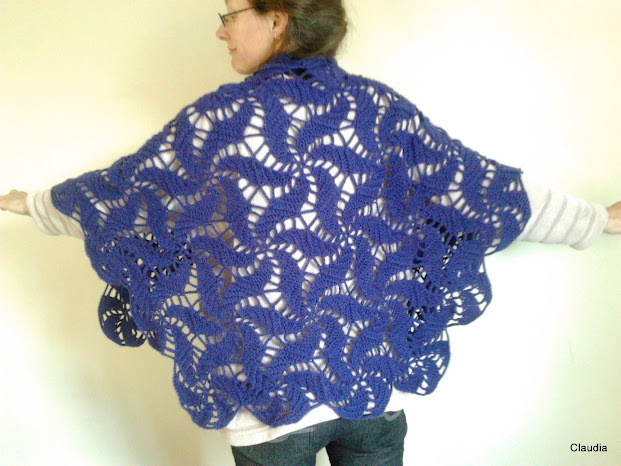 Yet another library book inspired me with this pattern for a shawl (the first actual pattern I’d attempted, rather than just making it up as I go). Still got a way to go to match my sister’s “Swirl” but for a beginner who only learned to crochet less than four months ago I’m pretty chuffed with it. Now it is spring, summer is not far around the corner, and I’m back in my herb garden and basking in the sunshine again. My “ideas” book has filled up with ideas faster than I can make them, so I’ll be back!